Innovation is a tradition at Mercy Hospital. Their surgeons pioneered some of the first open heart surgeries and they continue to stay at the forefront of modern cardiovascular care with state-of-the-art robotic surgery, life-saving stents and emergency surgery day and night as part of their compassionate and comprehensive 24/7/365 service. What’s more, Mercy Hospital now offers the new robotic surgery that is revolutionizing cardiac care. “Robotic and port-assisted surgeries allow smaller incisions to perform operations that have traditionally been done through the standard sternotomy,” says Dr. Farivar. “All patients with single valve diseases or thoracic surgeries that are amenable to robotic surgery are considered for a minimally invasive surgery.” Traditionally, patients have spent a week or more in the hospital. Currently, the average postoperative length of stay is 5 days or less. TAVR patients may be discharged in 1-2 days. With new minimally invasive valve procedures, the patients are often home within 3-4 days and can return to work in approximately 2 weeks. There is no “cracking of the sternum” and patients can recuperate much more quickly. The cardiac team also specializes in life-saving stents, including drug-eluting stents that are inserted with a balloon catheter to keep coronary arties open and reduce the chance of a heart attack. They can also perform all aspects of modern-day open heart including off-pump surgery as well as atrial fibrillation surgery, minimally invasive left atrial appendage ligation, pulmonary embolectomy and high-risk surgery for infected valves (i.e. endocarditis surgery), so all patient options are available within the system for enhanced care. There’s no need to go elsewhere, which is especially important when seconds count. Mercy Hospital is further distinguished by the fact that all of their surgeries are available at all times, and they make no distinction between day or night, weekday or weekend, holiday or regular work day. The emergency department has expertise in rapid door balloon times to open arteries in the case of emergencies. Other critical procedures available include thoracic surgery including lobectomy, esophagectomy, VATS (video assisted thoracoscopic surgery), mediastinal staging surgery and solitary pulmonary nodule clinic. Plus, the hospital has a dedicated cardiovascular ICU. “The cardiovascular department at Mercy is a fully staffed, modern cardiac service line,” says Dr. Farivar. “It comprises emergency cardiovascular care which is 24/7/365 staffed. It provides mechanical assist, ECMO (extra corporeal membrane oxygenation), and the full range of services from preventative cardiology to emergency care cardiac surgery. We provide electrophysiology, heart failure, office-based care, cardiac imaging and rehabilitation. We have a bloodless surgery program and provide minimally invasive cardiac surgery as well.” Additionally, within their HCA provider network, they also offer structural and transcatheter valvular work. 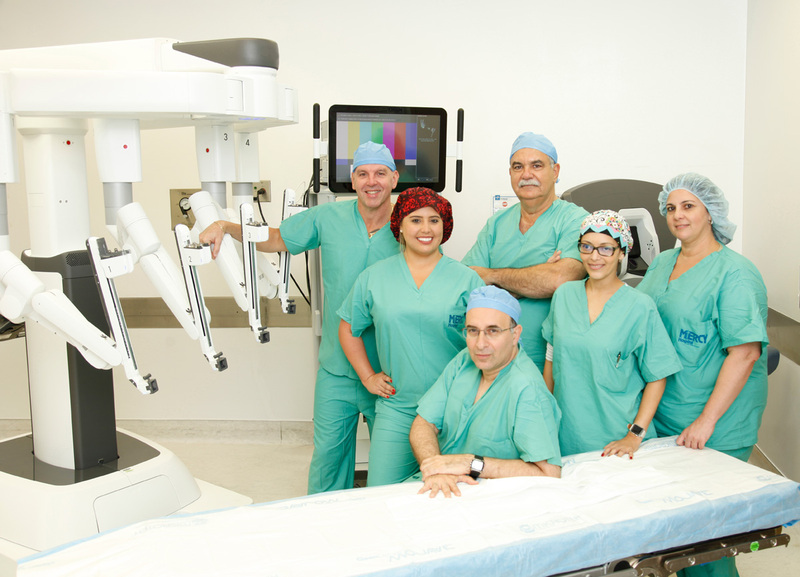 The hospital recently brought Dr. Christian Otero on board to provide thoracic and esophageal surgery. Similarly, Dr. Farivar, who is an expert in mitral and valvular surgery, recently relocated from Minneapolis Heart Institute, where he was Chairman & Chief of the program. He has currently performed over 2,000 valvular surgeries. Among his accomplishments, he performed the first transcatheter mitral valve replacement in the U.S., and has currently performed approximately 12% of the world’s transcatheter mitral valve replacements. He looks forward to bringing this expertise to South Florida. “One day we were called to take care of a close relative of someone who worked at the hospital,” he says. “He was missing a leg (amputee) from a diabetic complication. At first, we were not sure if we had any veins for his CABG surgery. Miraculously, we found great veins and were able to provide an A+ triple bypass surgery for this man. We used a sternal plating system to reinforce his chest since he used his arms much more than most. He ended up going home much quicker than expected, and with such renewed vigor that it was inspirational for many members of the team.” The dedicated heart team is a collaboration between the nurses, intensivists, cardiologists and surgeons who have a synergistic effect in the expert care of cardiovascular patients. They provide a holistic, family-centered approach to care that encourages children and families to partake in the care of cardiovascular patients. 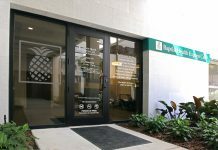 For more information, visit MercyMiami.com or call Consult-A-Nurse at 305.285.2929 for a physician referral. Mercy Hospital, A Campus of Plantation General Hospital, is located at 3663 S. Miami Ave. in Coconut Grove.